Ensuring patients with serious illnesses have access to palliative care can significantly improve their mood and quality of life, while reducing costs associated with end-of-life care, such as hospital admissions. To do so, it is important that we support the integration of palliative care into primary care, and enable clinical staff to engage patients and manage their needs. The initial phase of OneCity Health’s palliative care program focused on Simple Advance Planning, but now begins to integrate goal-setting and direct interventions – both non-opioid medications and behavioral approaches – to help patients right in the primary care setting. OneCity Health, in collaboration with our partner, the Metropolitan Jewish Healthcare System’s (MJHS) Institute for Innovation in Palliative Care, kicked off this next phase with a pair of palliative care trainings for our primary care partners focused on managing chronic pain and engaging in goals discussions with patients. At the training, we highlighted techniques to have structured conversations with patients about their values in order to identify appropriate support. Following these discussions, clinical staff can recommend treatment options, ranging from appropriate medications to self-management strategies such exercise, diet changes, stress management techniques or other behaviors. For example, our training sessions included segments on diaphragmatic breathing to reduce anxiety and stress, and positive coping techniques to alleviate negative thoughts, all of which are linked to pain. 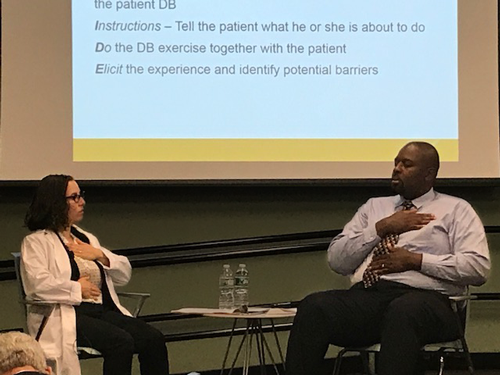 Dr. Ernest Garnier of SUNY Downstate Medical Center and Lisa Rosenzweig, PhD, of the MJHS Institute for Innovation in Palliative Care demonstrate breathing exercises to manage pain at a OneCity Health training. Over the next six months, we’ll continue to work with our participating partners on quality improvement to further integrate palliative care into their primary care practices. We will also make additional training resources available to all of the OneCity Health Performing Provider System (PPS).